Perhaps as much as to the others, I am indebted to the ritualists who, for many years, have invited me to their sacrifices. In addition to the Ahitagnis who often arranged for my food and housing, my heartfelt gratitude is extended to the officiants at the sacrifices, whose job it is to put into action what I can know only on paper. In particular, I must mention Kesava Sttararn [joglekar, Dinakara Balkrsna joglekar, and Ramacandra Bhatta Kodlekere of Gokarn ; Viivanath Srauti and his son Ganapati of Nellore ; and Agnihotram Ramanuja Tatachariar. All of them have made every effort to see that I have been invited to attend Soma and other sacrifices at which they have officiated from 1980 up to the present; and they took great pains to provide for me a running commentary on the rituals, much of which has found its way into the notes in the present work. Thanks are also due to the late Prof. V. V. Bhide of Poona University for his personal friendship and contagious enthusiasm for the minutiae of Vedic ritual, and to Radhe Shyam Shastri for a few helpful suggestions. Only through the focus of the interests and unique talents of my guides in both the academic and ritualistic lokas was I able to write this, as it involved, at every step, a liaison between textual study and fieldwork, our equivalents to s'Vadhyaya and prayoga. I must also thank my sahfidhyayins in the study of Vedic ritual, especially my wife, Kathy, and my friend and colleague Harold F. Arnold, and occasionally another friend and colleague Christopher Z. Minkowski, who trekked the length and breadth of India with me ( or so it now seems) in often unforgiving weather and conveyances, " in search of the yag ". I am also indebted to Harold Arnold for carefully reading through an earlier draft of the introduction and offering many helpful suggestions. I must express my appreciation to the American Institute of Indian Studies for giving me two fellowships, the first which enabled me to carry out the original fieldwork for this volume and the second which gave me time to rewrite it. I am especially grateful to Mr. M. D. Bhandare of the A. I. I. S. office in Poena and Prof. S. D. Joshi, formerly Director of the Center for Advanced Study in Sanskrit at Poena University, for facilitating my many lengthy sojourns in India. Considerable credit is also due to Mr. A. N. Gokhaley of the Bhandarkar Oriental Research Institute, for his assiduousness in seeing this work through the press in a relatively short time and for occasionally doubling as my editor. My greatest debt, and greatest thanks, are to my parents, Drs. Marcus and Carol Smith, and to my wife, Kathy, for their unfailing support and interest in my work, and for the hardships they often endured for its sake. I only regret that my father, a fine scholar and tapasvin in his own right, is no longer here to enjoy this particular yajnaphala. Towards the end of the eighteenth century. Western scholars undertook the study of Indology along modern critical and comparative lines. The old generations of scholars from the west had scarcely an opportunity to visit India and see things for themselves; nor did they deem it essential to do so. In spite of the absence of traditional background, they studied Sanskrit language and literature, and shed important light on the knowledge of history and culture of ancient and medieval India. The present generation of Western scholars, however, deems it beneficial to visit different parts of urban and rural India and make an on-the-spot study of old traditions. Facing difficulties of manifold nature, these scholars traverse remote regions and collect data which are fast disappearing. Dr. Smith is one among these. 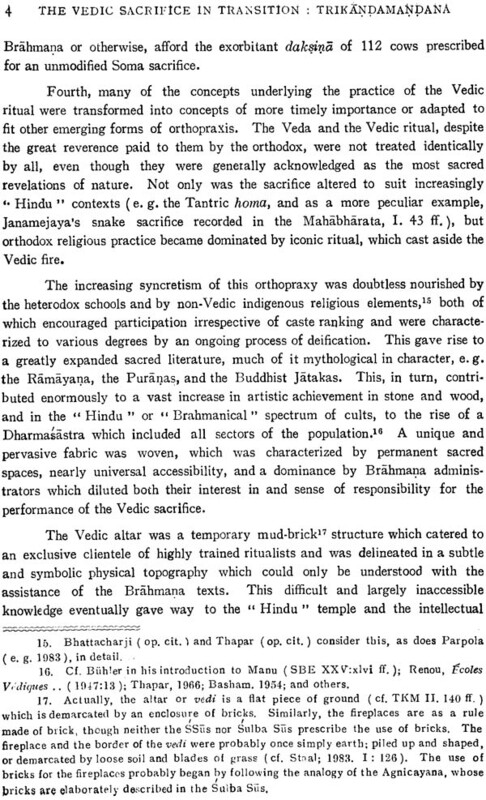 Trikandamandana aims at recording and stabilising the various modifications in the Vedic sacrificial rites. Modification of rites is not a feature of the medieval period alone. In the Vedic period itself the Srauta religious practices must have undergone changes, big and small, in their different aspects. The various recensions and schools bear testimony to this. The process ot variation probably received greater impetus in course of time as a result of change in social, economic and geographical circumstances. 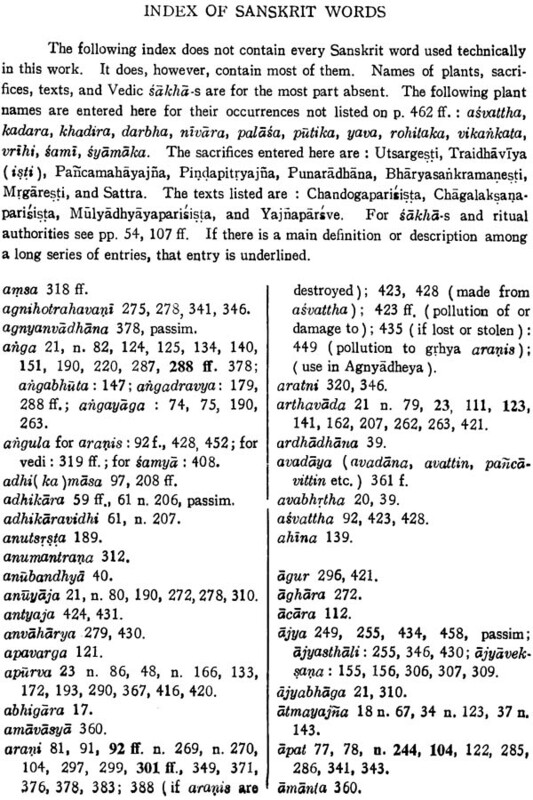 Trikandamandana of Bhaskaramisra who flourished in the eleventh century A.. D. aimed at the confirmation of the Apastamba tradition as it stood in his time. He calls the details given by him as " suggested meaning" (dhvanitartha). Some of these details may really be "suggested". 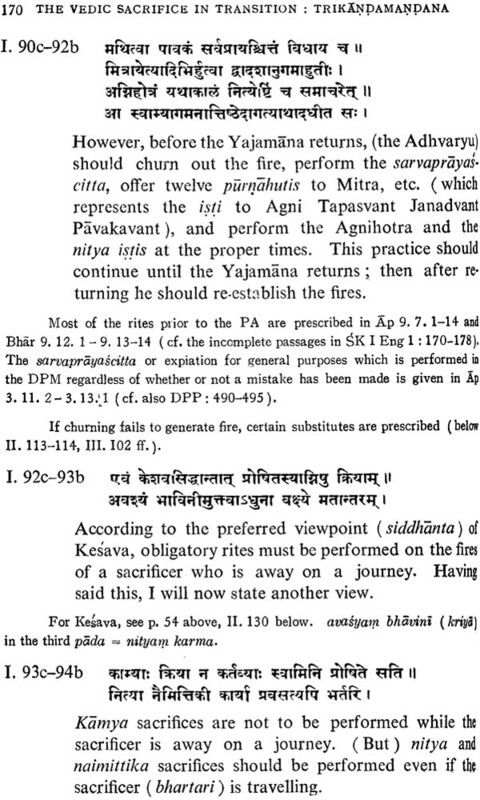 that is to say, they might have been In practice in the days of Apastamba Srautasiitra even though they may not have been directly mentioned in the Siitra-text, But there are many more directions which have been borrowed from other Vedic schools, belonging not only to the Taittirlya but also to the other recensions and Vedas. Obviously these must have come into practice by reason of changes in manifold circumstances. 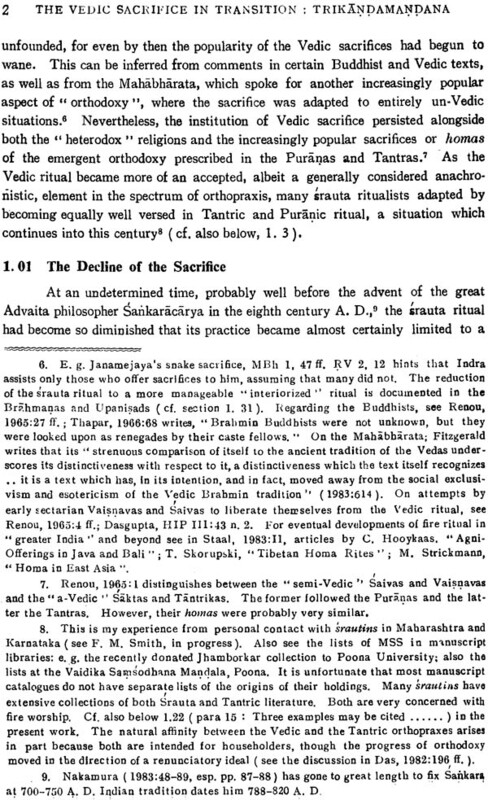 Thus Trikandamandana brought the rites up-to-date as they came up to the eleventh century A. D.
The theory of Vedic sacrifice has been a subject of discussion for many years. There is a view that the Vedic sacrifice was nothing but an exposition of magic. It is a matter of gratification that Dr. Smith does not share this extreme view. He rightly holds that the sacrifice has also an inner meaning side by side with the element of magic. 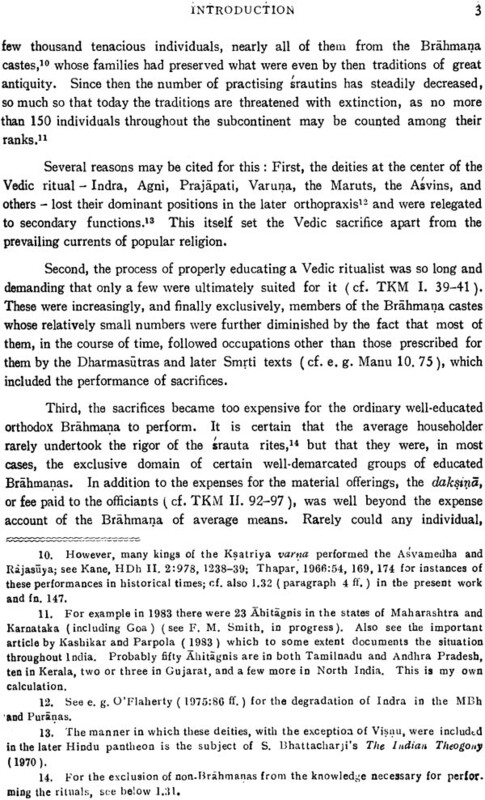 The subject of Hinduization of the Vedic sacrifice has come to the forefront particularly since young Western scholars began to witness critically the sacrificial performances in the southern parts of India. 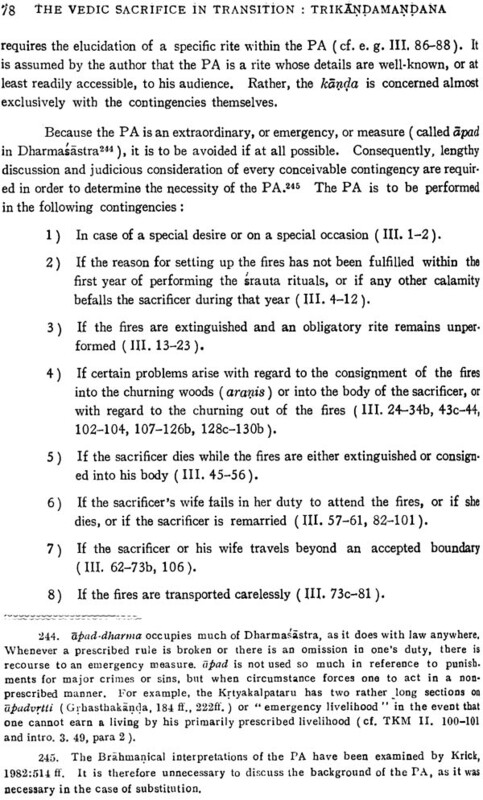 The Vedas are mostly concerned with the sacrificial rituals. At the same time, the domestic rites, even though mainly laid down in the Grhya and other Siitra-texts and rarely in the Mantra-Brahmanas, were being practised by each and every family. 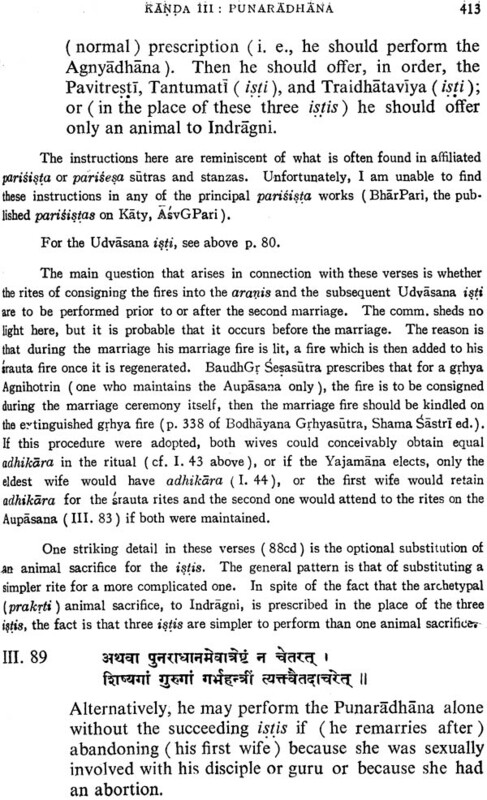 So, even in the Vedic period certain domestic rites and customs were very probably appended to the sacrificial rituals even though they cannot be expected to find a reference In the sacrificial ritualtexts. One need not wonder that in the medieval period one finds references to the sacrificer going on pilgrimage to holy places, and performing FU1J,yiihavacana, Nandisraddha and other purificatory rites before commencing a Soma-sacrifice. In modern times one finds different religious customs being observed in different regions of India prior to or accompanying the performance of a Vedic sacrifice. This, however, does not mean that the actual performance of a Vedic sacrifice has been formally encroached upon by Hindu customs. The Vedic sacrifice, performed following the Prayoga which in its turn may have varied a little from the Srauta-Sutra, is itself pure. Trikandamandana has mentioned in the second chapter substitutes of the Soma plant. In this connection it needs to be noted that a substitute is to be employed only in case the arrangements made for procuring the genuine Soma plant at the proper time have failed, that the performance of the sacrifice should be concluded by employing the substitute, and that a Soma. sacrifice is to be performed again after having procured the genuine Soma. Thus the substitution of Soma has a limited meaning. The commentator of Trikandamandana ( II. 32 ) has mentioned three factors of a substitute, namely, samipya, var1J,a and akrti. 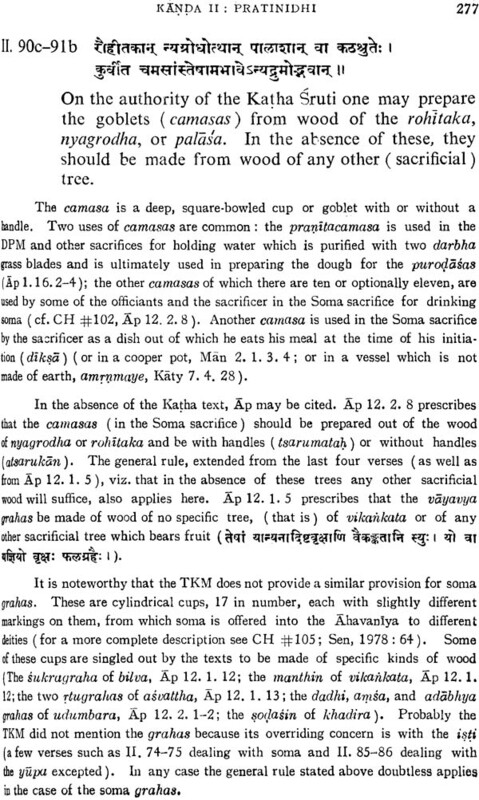 There is no other substance which belongs to the class of Soma (samipa). It is by resorting to the two other factors, namely, vartul and akrti that different substitutes for Soma are employed in different regions of India. It may be presumed in all probability that Trikandamandana had the knowledge of the genuine Soma plant, although it must be said that the problem of its identification cannot be said to have been finally decided. Though a discussion of this problem would be out of place here, let me reiterate my conviction that the plant Ephedra has the best claim to be identified with Soma, and that the theory of the mushroom Amanita muscaria being the real Soma plant cannot stand for various reasons. The question of the original home of the followers of Taittiriya recension of Kr~l,1a Yajurveda has engaged the attention of scholars for about a century, G. Buhler had stated that the followers of the Baudhayana, Apastamba and other schools of Taittlrlya recension belonged to the southern parts of India. Recent research has conclusively proved that the followers of all Taittirlya schools originally belonged to the northern parts of India and that in course of time they migrated towards the south. I am happy to note that Dr. Smith agrees with this view. It is high time that the theory of southern India being the original seat of the Taittiriyas be finally set aside and that the fact of northern parts of India being their original home be formally acknowledged. I hope the scientific study of Trikandamandana presented here by Dr. Smith will pave the way to further research in the religious and cultural study of medieval India. 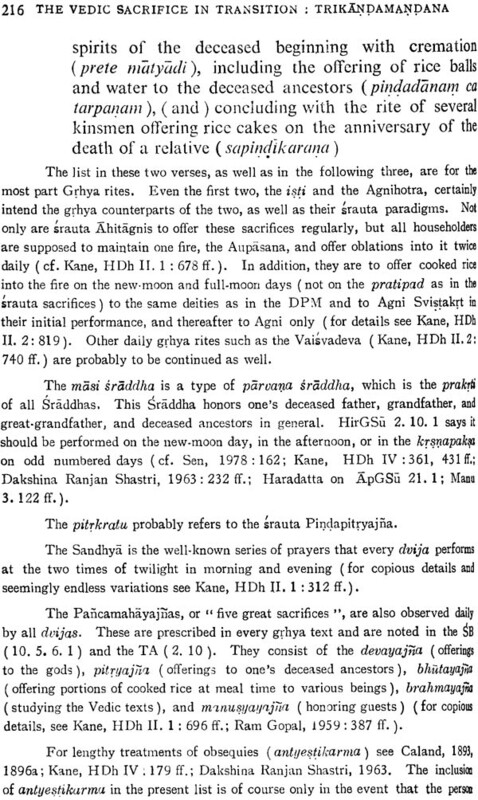 The Trikandamandana ( TKM ) or Apastambasutradhvanitarthakariki is a Sanskrit verse text composed by a little known medieval ritualist named Bhaskaramisra Somayajin, or simply Bhaskara Misra, as a supplement (paristal) to the Apastamba Srautasutra. 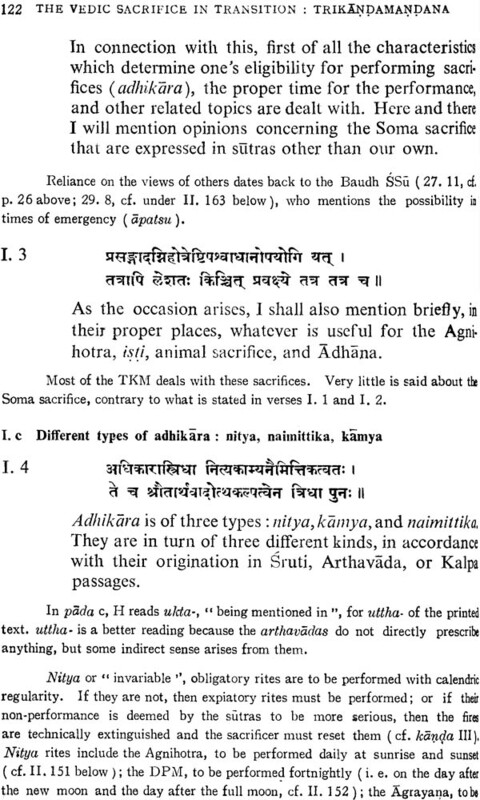 We know from the colophons of his three chapters (kandas) that the author gives himself the title "Trikandamandana”. There he calls himself Trikandamandana .bhaskaramisrasomayajin : the soma sacrificer Bhaskara Misra who is adorning (mandana) the Veda n its three (tri-) traditional kandas or sections namely the karmakanda or section dealing with ritual, the upasanakanda or section dealing with worship; and the jnanakanda or section dealing with knowledge. It is likely that Hemadri, who probably lived only a few decades after Bhaskara Misra, knew him as Trikandamandana . 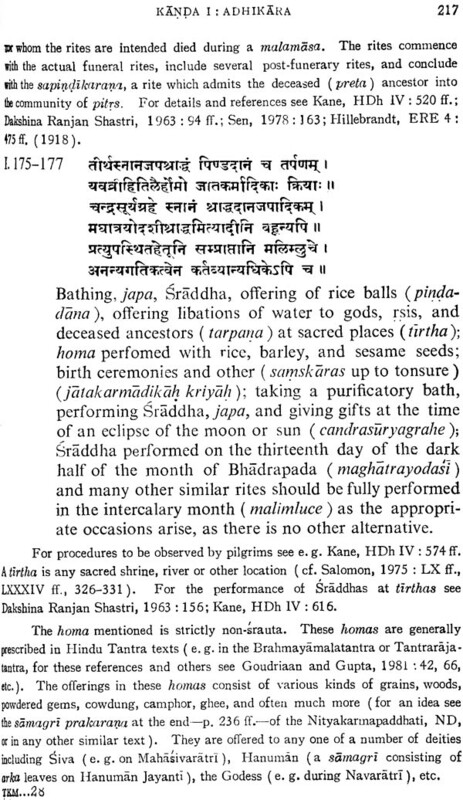 If this is true then it is possible that the work Hemadri knows as "Trikandamandana ", dealing with dharma and pr1ja, is different from our TKM, but by the same author. We must conclude this because the verses Hemadri quotes are not found in our TKM. 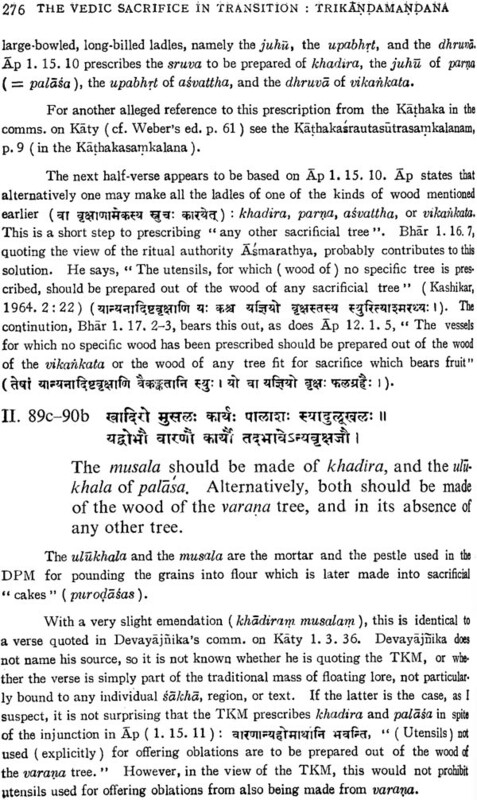 The alleged fourth kanda of our text, then, would be nothing more than a second work of Bhaskara Misra appended to the end of our TKM in a very small minority of manuscripts.t Hemadri, however, is not alone in referring to the author as "Trikandamandana". The commentator on the TKM also seems to refer to Trikandamandana as the author of the text. Because the subject matter of the TKM was of paramount importance for practising srautins, the TKM became especially important in the history of the Apastamba ritual tradition. The fact that the Apastamba sakha has been predominant for at least two millennia in much of South India and Maharashtra underscores the necessity for the study of this text. 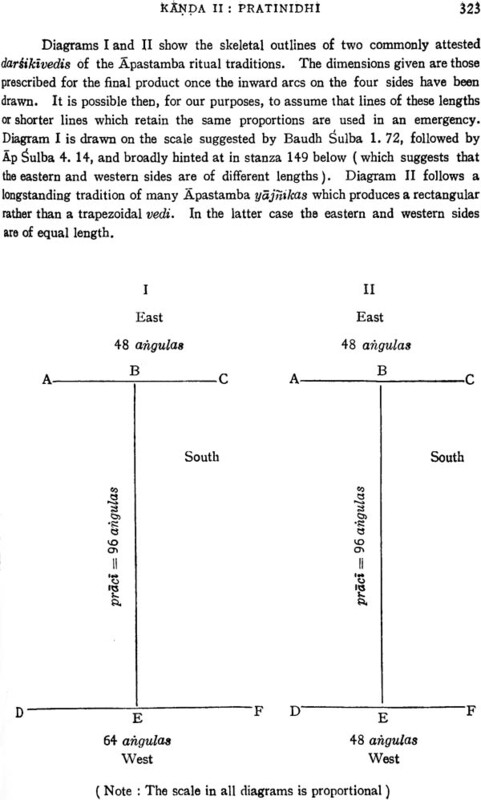 The significance attested by the histoncal position of the Apastamba sakha is further enhanced by the fact that Apastamba ritualists have maintained their sraiua traditions more completel-y than have ritualists of the other Vedic sakhas, at least in the sense that in the twentieth century Apastambins comprise about 80% of the practising Vedic ritualists in India. Among the texts of long-standing use within the Apastamba tradition is the TKM, which is still consulted by many Apastamba ritualists in South India and has not been superseded by a more recent text. 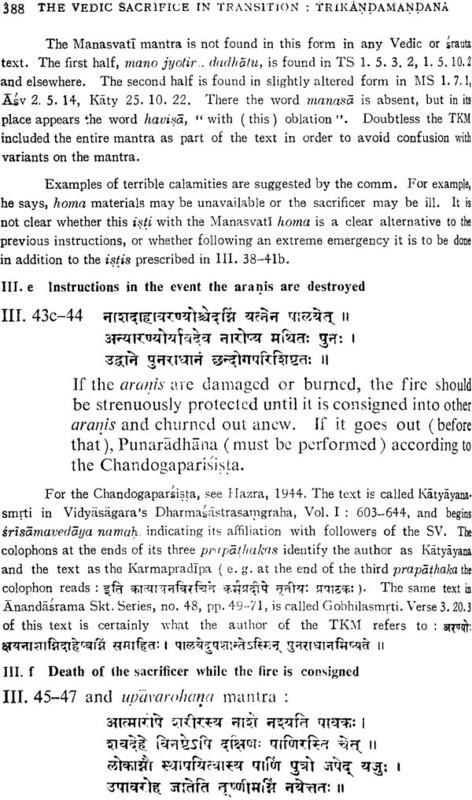 The TKM has thus proven to be of great practical value not because it merely repeats the injunctions found in the Apastamba Srautasiitra or summarizes the commentaries on it, but because, as the original title suggests, it gives in verse form (karika) the "suggested" or "echoed" (dhvanita•) meaning (artha- ) of the siitras of Apastamba. What this means in practice is that the views or practices of ritualists outside the Apastamba school are granted authority if the"views or practices of the Apssu or of the ritualists within that school who may observe variant practices cannot be applied in a particular situation or are regarded as potentially troublesome. 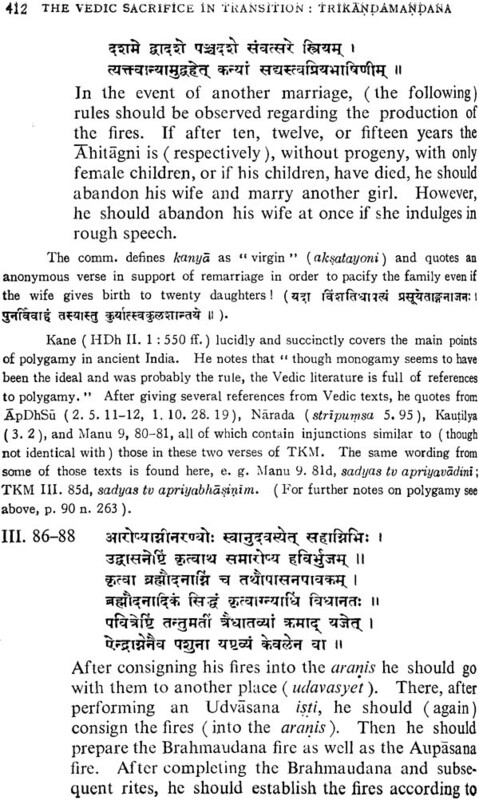 Because the topics discussed in the TKM play paramount roles in the continuing development of the Vedic ritual, because the genre of "medieval" texts have almost entirely supplanted the original Srautasiitra texts as guidelines to the ritual, an annotated translation of the TKM emerges as a task of greater value in elucidating the history of the Vedic ritual tradition than would be, for example, a comparative study of the views of the various Srautasiitras on a single topic such as substitution. The latter would have no precise focus in the ritual tradition, while a study of the TKM - being itself a representative text of the Apastamba school which refers to many views outside of it - naturally provides this focus. What I am attempting to furnish here is a body of data which defines and provides the parameters for a few fundamental concepts (e. g. adhikara, pratinidhi) which are brought to bear in the practice of the Vedic ritual. It is hoped that this can contribute to a more complete history of the Vedic ritual. Total completeness is, however, well beyond the goal of the present study. 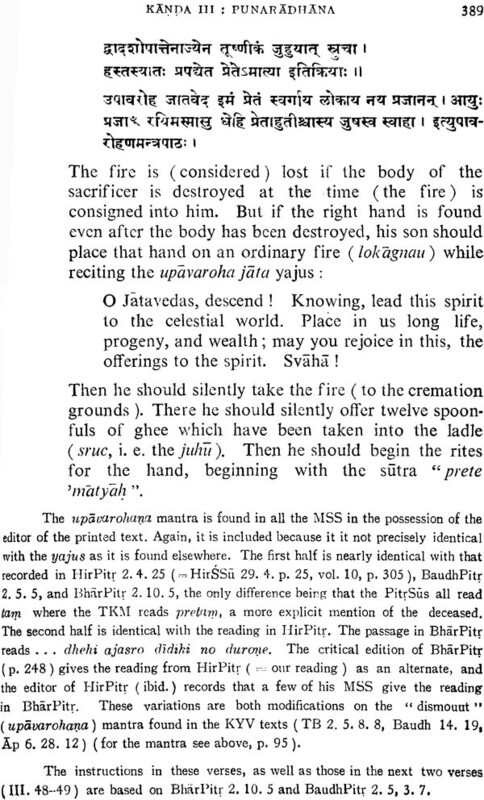 As any scholar acquainted with the practical side of Vedic ritual is well aware, much of the ritual- as will be pointed out periodically in the course of this work - was never written down, and many of the texts relating to different sakhas are missing and probably irretrievably lost. In this respect, however, renewed efforts at tracking down missing texts may prove fruitful.! Meanwhile, any attempt to write a decisive history based on what partial and refractory evidence is presently at our disposal is bound to be tentative, at best. What, then, may be gained from this study? Firstly, one may be better able to understand the mechanisms that enable a Vedic school to expand the boundaries of acceptable practice. It is important to understand that the TKM was consciously written as a dharma text clearly intended by its author to be a parisita of the Apastamba ssa. Soon, fortuitously, its injunctions were accepted as authoritative by Apastamba ritualists. 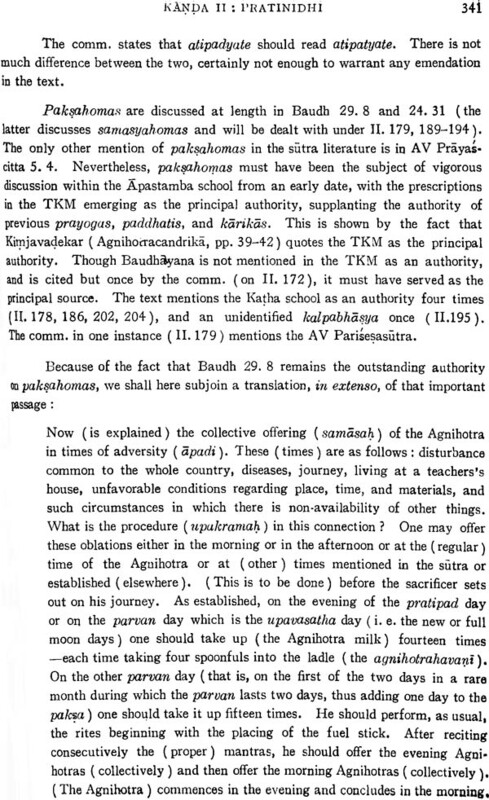 This admission of the TKM into the accepted corpus of Apastamba dharma texts was the cornerstone to legitimizing the rules and practices discussed in the text. 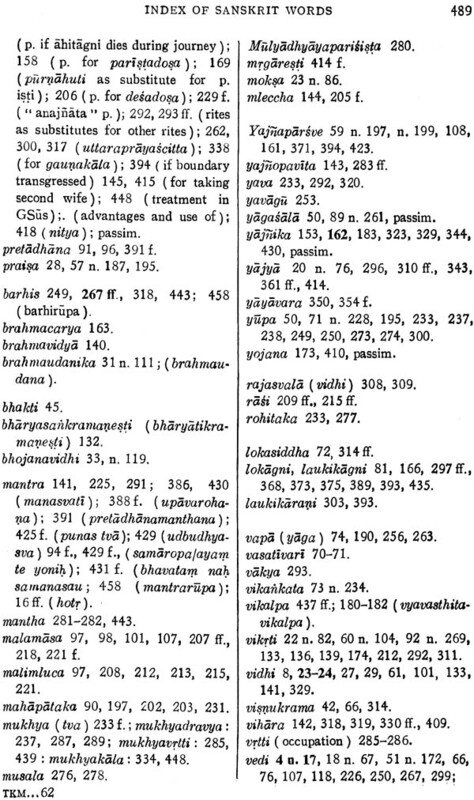 It is apparent from the long list of ritual authorities who are outside the Apastamba 5akha that there was a need within the sakha for a text that would legitimize their views, regardless of whether or not Apastamba srautins here and there were already in fact adopting some of these rules and practices.
. Prof. E. P. Evans, in a biographical note on the life of Martin Haug, prefacing Haug's Essays on the Rehqion. 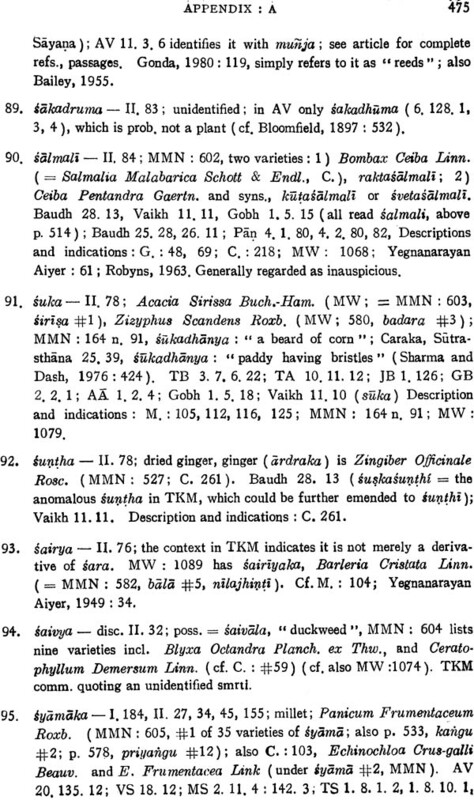 of the Parsees, writes of his Aitareya Brahrnana notes (cf. Haug, 1863. 2) that "by actual autopsy, [he] learned the real meaning of Brahmanical ritualism." To set the matter straight, Haug did not resort to "autopsy", for the Vedic ritual tradition was not dead a century ago; nor is it dead today. 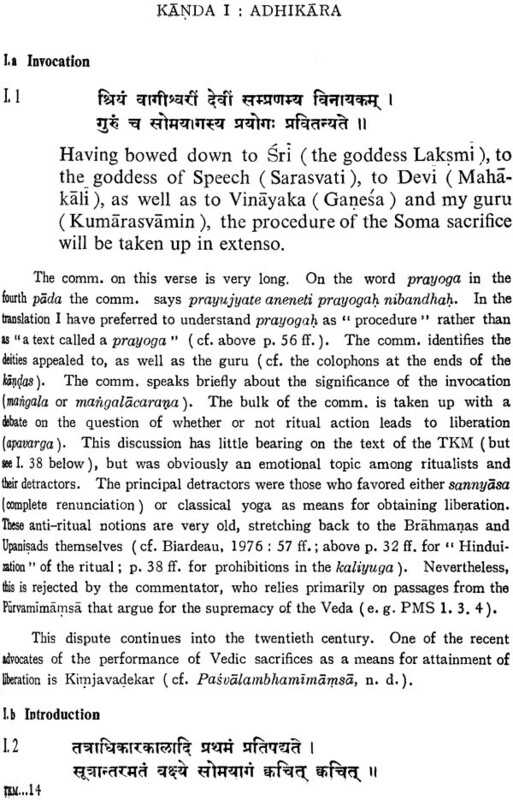 Staal's monumental volumes (1983) and the study by Kashikar and Parpola contained in Volume II of that work significantly advance our knowledge of the ritual traditions i~ the twentieth century. The TKM, standing midway between the composition of the Srautasiitras and the present day performance, can well serve as a link in our understanding of the Vedic ritual traditions and the mechanisms that enabled it to survive. A proper understanding of this rests not only in textual explication of the livlna' tradition, even as it appears long after the composition of the TKM. 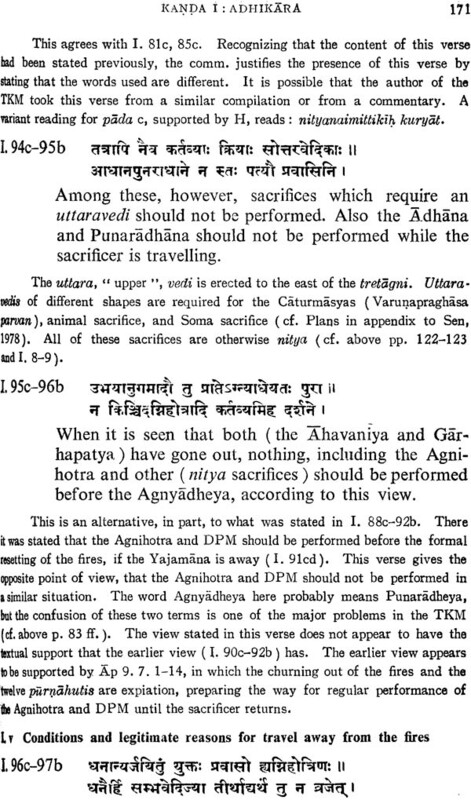 Thus, like Haug, I have to some extent depended on the authority of present day ritualists on occasions where the text does not easily yield sense or where the sense may be idiomatic within the ritual itself ( e. g. the term nil'manthyagni, below TKM II. 121,). From a study of the TKM it will be possible to draw nearer to a description of the state of srauta performance a thousand years ago, a description that will enable us to approach more confidently the elusive history of the ancient institution of Vedic ritualism. Because there are many gaps in our knowledge of this history, I hope that the present study, drawing from both the literature and the performances, helps reduce the impressionism that has characterized much of the writing about religion and ritual in India while simultaneously providing a focus for investigating certain concrete historical and intellectual processes that moulded much of Indian thought. We must now turn our attention to a few remaining points regarding the composition of this study. 1) The TKM presents a host of challenges and problems. Fortunately, not among them is the editing of the text (a few instances where this is necessary do nevertheless arise, e. g. II. 78-80). Particularly daunting is the tracing of sources or authorities for the various views cited by the author. This is in fact the major problem. Much of the value of the TKM lies in its sources, and why they were selected. Thus, considerable portions of my annotations are devoted to this problem. 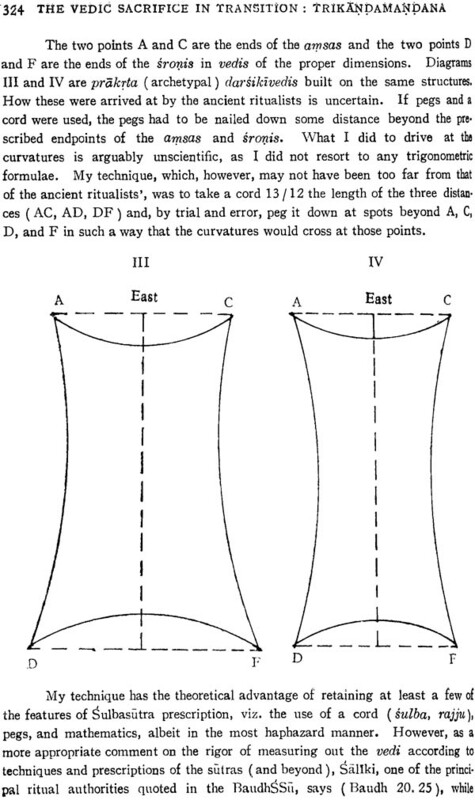 Occasionally I have been unable to trace the origin of a certain view, even in instances where the text (or commentary; below, p. 116) provides the name of the ( alleg;d) source. For example, on I. 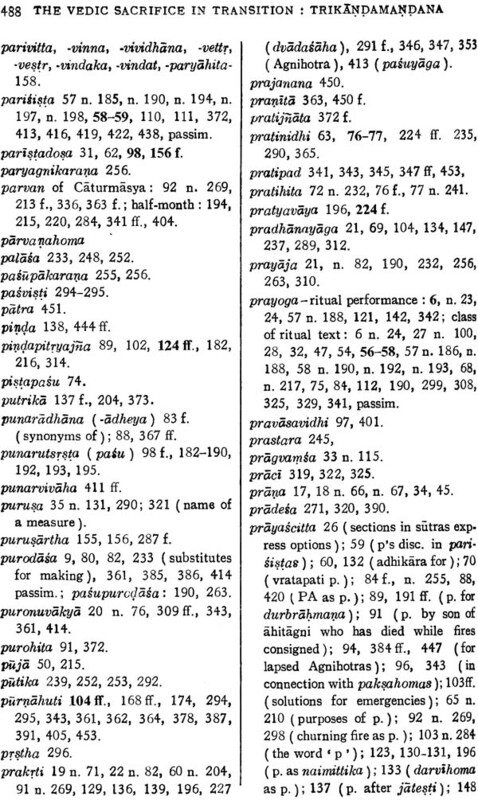 42 (below, p, 144) the commentator quotes Hemadri, whose 2000 + page Caturvargacintamani lacks an index, making verification extremely difficult. 2) A priority in citation is generally accorded to the texts of the Krsnayajurveda. Wherever possible, the Srautasiitra of Apastamba takes precedence. Following this are the SSiis of Bharadvaja, Baudhayana, and Satyasadha Hiranyakesi, Sometimes the SSiis of Katyayana, Manava, Vaikhanasa and others serve as the primary sources for the topic in question and are therefore given priority. 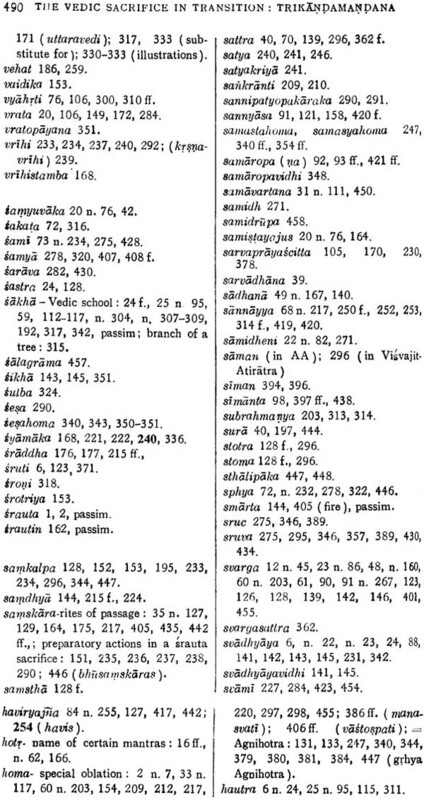 Occasionally also the Piirvamtmamsasiitras of aimini, Sahara's commentary on them, various commentaries on the SSiis, or medieval Dharmasastra texts take precedence. 3) The text is generally lucid and straightforward. 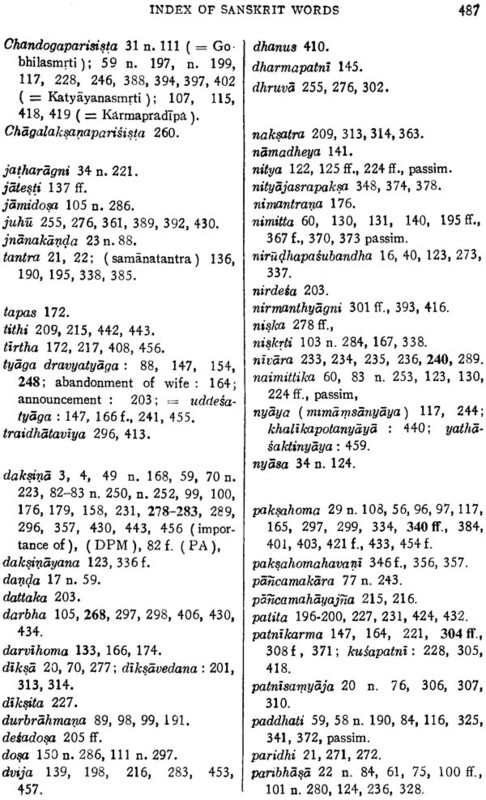 Most of the terminology employed in the text is taken from Vedic sources, where the meaning is often debatable; but these terms are used unambiguously in the TKM. 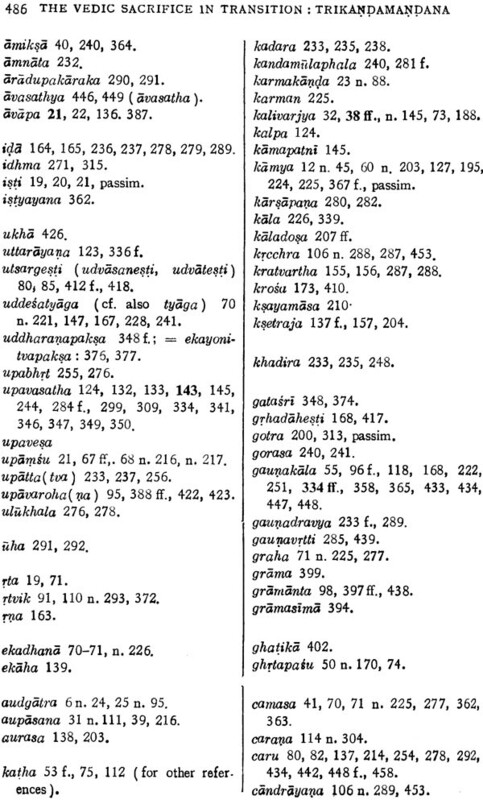 If I were to present a philological and bibliographic account of every interesting word in the text (e. g. porista-, prayascitta- etc. ) the size of this long volume could double. For the purposes of elucidating the text and the rituals it discusses which are my primary goals here, such an account is unnecessary. The single exception to this is plant names occurring in the second kattQ,a, in which I have developed a special interest. 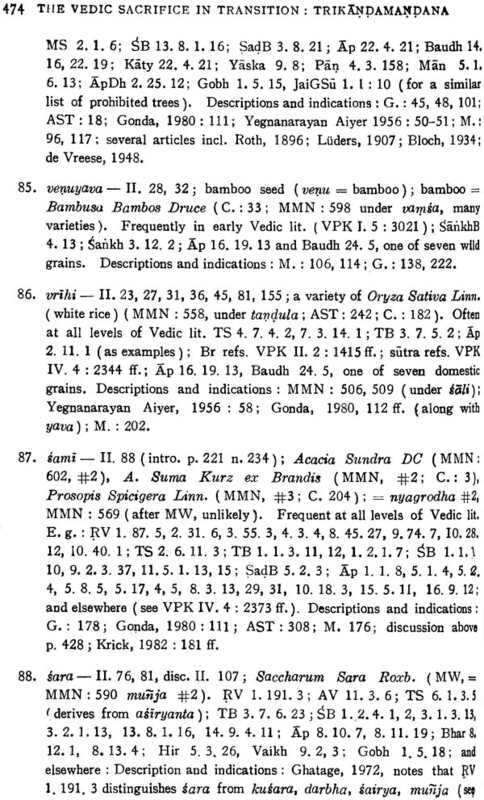 As Meulenbeld notes (J 974 : 4) "The botanical identifications of plants mentioned in Sanskrit texts is a field in which almost complete confusion reigns, a fact of which every Sanskritist is constantly aware. " 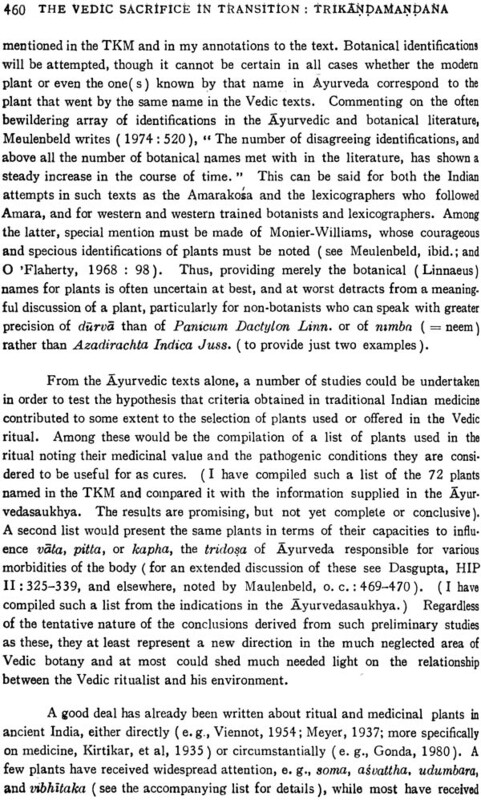 Thus, I have attempted to survey the identifications found in the literature and supply a few references to the uses of the plants according to selected Ayurvedic and ritual texts. All of this information has been placed in Appendix A. 4) Most of the research for this volume was completed by mid-1984. Thus, I have not been able to fully consider work done after that date. Among the work on Vedic ritual completed after that, a few studies are worth mentioning because they bear on this study and would have been more fully utilized were the present work to go through another revision. 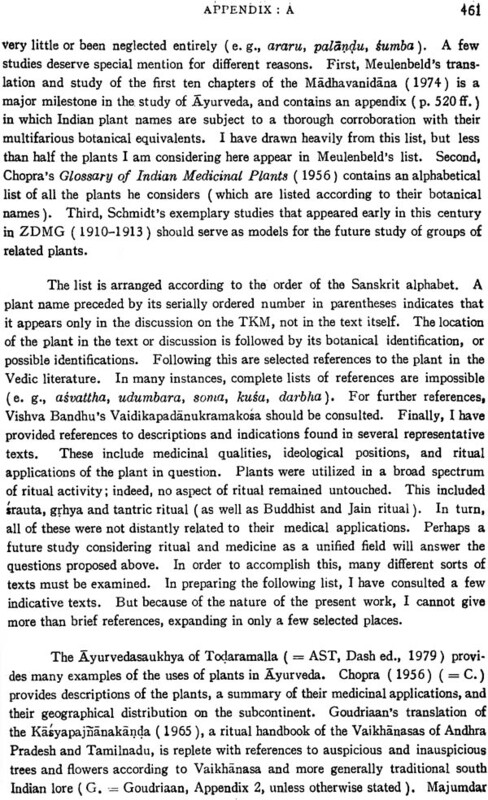 Note especially: J. Gonda, Ritual Function and Sigpificance of Grasses in the Religion of the Veda, 1985, and C. Z. Minkowski, The M aitravarutta Priest, 1986, for their contributions to knowledge and identification of plants; and F. X. Clooney's study ( 1986) of the concepts of puruedrtha and kratvartha. These sources are twofold: firstly they include the prayoga~, paddhatis. Pariii as, and medieval commentaries on the ritual sutras, and secondly they must include observation and documentation of the rituals themselves, which are after all the primary expression of the traditions, of which the texts are mere adjuncts. Until more of the requisite texts and rituals are studied in situ, application of sophisticated methodologies to such problems as the interdependence of the textual and ritual traditions cannot yield analyses commensurate in detail or sophistication to the refinement achieved In the development of the theories themselves. Furthermore, it is usually impossible to defend one general theory as being exclusively valid when others remain untested. For example, one can say" Vedic ritual makes sense, but it is structural sense" (Staal, 1986: 64), while other types of sense may also be valid, or partially valid. A balance must be struck between the logic of form and the apparent randomness of inspiration. 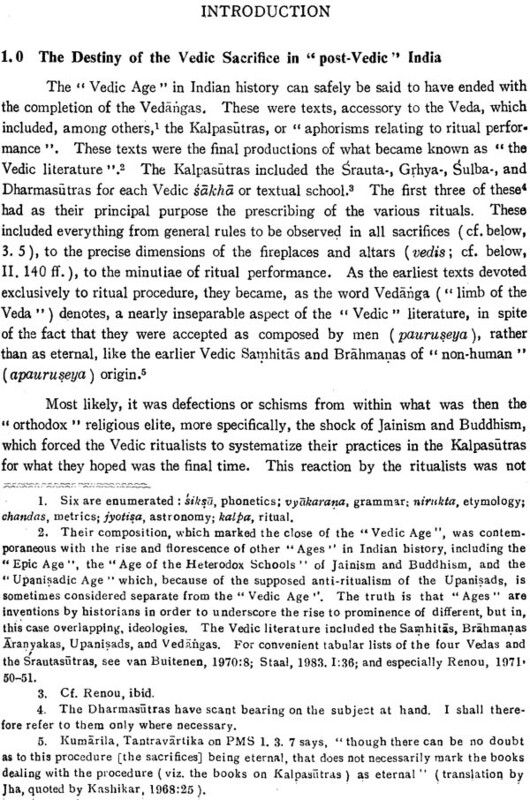 When examining the Vedic ritual as a historical phenomenon one should not, for example, reject out of hand the validity of the native interpretations proposed in the Brahmanas. 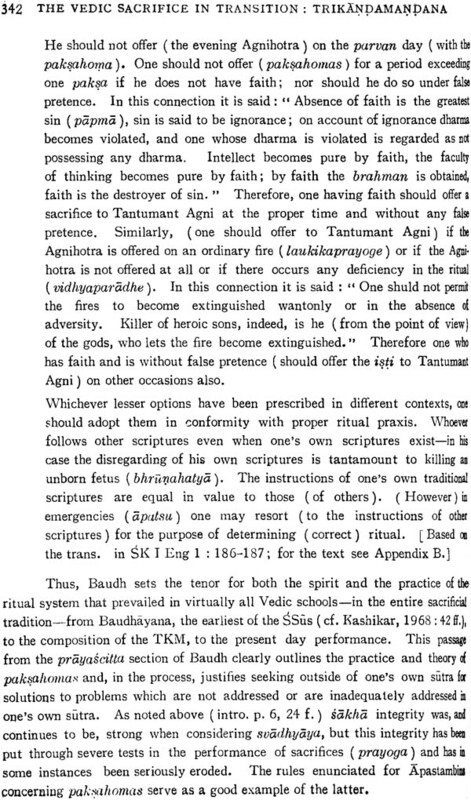 Additionally, if One is to consider the entire history of irauia ritualism, one must even examine the influence on the ritual traditions of the revisionist interpretations of the Vedic ritual proposed in the Puranas. Thus there arises a host of religions: Vedic, Brahmanical, HIndu, Buddhist, Bonpo, Tantric, Confucian, Shinto, etc. In India, and in Asia generally, such groupings are not only uninteresting but uninformative and tinged with the unreal. What counts instead are ancestors and teachers - hence lineages, traditions, affiliations, cults, eligibility, initiation, and injunction - concepts with ritual rather than truth. functional overtones. These notions do not pertain to questions of truth, but to practical questions: What should followers of a tradition do? This is precisely what makes such notions pertain to the domain of karman. Hence orthopraxy, not orthodoxy, is the operative concept in India. And. indeed, the TrikiiI.lqamaI}.4ana. as well as its relations with the other “ religious " and" cultural" elements that bore it through history. lies entirely within the domain of orthopraxy.